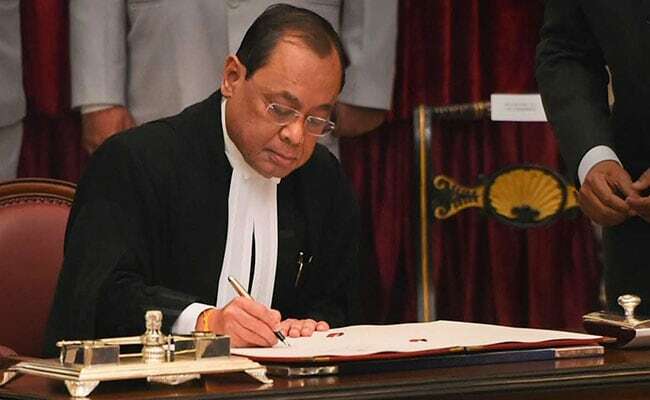 Justice Ranjan Gogoi became the 46th Chief Justice of India today. Hours after taking over as the 46th Chief Justice of India, Justice Ranjan Gogoi addressed his colleagues at the Supreme Court Bar Association and praised the Bar's rich and illustrious legacy. Let's try and keep it up, he urged. Lawyers are the most respected people... there is no doubt about that, the Chief Justice told his colleagues. Chief Justice Gogoi took names of icons such as Mahatma Gandhi, Jawaharlal Nehru, Lala Lajpat Rai, Bal Gangadhar Tilak, Dr BR Ambedkar, Cornelia Sorabji, Motilal Mehru, Sardar Patel, CR Das and C Rajagopalachari among others to highlight the brilliance of the Bar. During the day, Chief Justice Gogoi came to the Raj Ghat to pay respects to Mahatma Gandhi. The Chief Justice brought a few-page-long speech, but chose not to read from it saying "everybody seems to be in a hurry". With a promise of a quick wrap, he spoke on issues and concerns of the community. "We are trying to reduce the time between filing and listing of cases. We are trying to introduce a system by which the cases will not be dropped from the list. If we succeed,a large segment of mentioning would go away," the Chief Justice said. Filling of vacancies will be a top priority for Chief Justice Gogoi, the first person from the Northeast to reach the top position of judiciary. "There are 5,000 vacancies at the subordinate level. I am working on priority to fill these vacancies. We hope to do that in the next few months. But that only will not solve our problems. It won't be a complete solution. The solution lies in getting the right man and the right man will come only if the office maintains its dignity and aura," the 63-year-old said. Chief Justice Gogoi have a little over 13 months before retiring on November 17, 2019. On a lighter note, he said, "I am told that I am a strict man. I am what I am I can't change that." The chief justice has already issued a new roster, in which he kept most of the Public Interest Litigations (PILs) with himself. Some of the cases will be heard by Justice Madan B Lokur. "No urgent mentioning of cases will be allowed" till certain "parameters" are fixed for it, the Chief Justice said. "We will work out the parameters then we will see as to how mentioning will be done... If somebody is going to be hanged tomorrow, then we can understand (urgency)," Chief Justice Gogoi said. The issue of rostering of the Supreme Court judges had made headlines in January after four of the court's most senior judges held an unprecedented press conference to flag their concerns on the issue. Cases of national importance, they said, were being assigned to judges who are lower in the top court's hierarchy.